Powered by the FleetLink Vision+™ on-board computing solution and the FleetLink Map™ , FleetLink Reports™, and FleetLink Safety Dashboard™ web-based applications, FleetMind has developed a complete solution that drives meaningful, lasting improvements to fleet safety, characterized by improved driver behaviors and reductions in accidents. 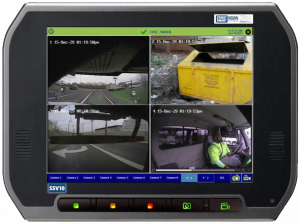 With connectivity to up to 8 cameras in and around the vehicle, FleetLink Vision+ provides drivers with the visibility they need to do their jobs safely and effectively. Camera views can be set to full screen for maximum usability or multiple views can be presented at a time. The rear camera view kicks into full-screen mode automatically when the vehicle is backing up. In addition to capturing GPS data to determine speed and direction of travel, FleetLink Vision+ also integrates with the vehicle’s engine control module (ECM), enabling it to capture vehicle telemetry such as harsh braking and cornering or rapid acceleration. This data is immediately uploaded to the FleetLink suite of back-office applications. Breadcrumbs showing the vehicle itinerary and performance since it took the road are viewable from within FleetLink Map, displayed on an intuitive color-coded map. Clicking a breadcrumb brings up the vehicle’s location, time of day, and speed. Using FleetLink Map, supervisors and safety managers can play back driver itineraries at any point in the day to understand the circumstances leading up to and including a safety incident. GPS and ECM data can also trigger reporting thresholds, enabling them to be flagged for easy viewing within FleetLink Reports. Access to such data enables supervisors and safety managers to understand the real-world behaviors of their drivers and to address them with irrefutable evidence. It also supports pro-active coaching to improve behaviors. FleetLink Vision+ is constantly recording video. When an accident occurs or a GPS or ECM-based alarm is triggered, FleetLink Vision+ uploads a snippet of the video, with the seconds preceding the accident and immediately afterward, to FleetLink Safety Dashboard, where it can be viewed by a supervisor or safety manager. This video provides the context necessary to better understand and interpret events.